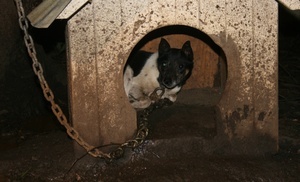 In many areas of the country, it’s not uncommon to see a chained dog. A family in our neighborhood keeps their dog on a chain, probably twelve feet long, attached to a stake in the ground. Their unfenced backyard butts up to the largely deserted arroyo where I walk my own dogs, Uno and Maybe. Whenever we pass by, the Shepherd mix barks like crazy, racing as close to the arroyo as he can until his chain is pulled taut. He has a small, slightly run-down doghouse in which to take cover when it rains. I don’t know for certain, but I’m guessing this is also where he goes (as opposed to inside the family trailer) when winter temperatures fall below zero at night. I’ve never, ever walked past and not seen the dog chained to his stake. His fur is scraggly, but he doesn’t look malnourished. And I’d be anthropomorphizing if I said he appeared sad, lonely, and desperate for attention. I’m convinced he’s bored out of his mind, gazing at the same barren stretch of land day after day after day, but again, that’s just speculation. The dog has water, food, and shelter. By law, in many states, that’s all that’s required. A ‘fate worse than death’: whose definition? As a shelter volunteer, I see situations on a weekly basis in which I wish an animal would’ve been euthanized as a newborn instead of having to endure the trauma he did. I see animals that have been starved, burned, maimed, and beaten. I’ve seen dogs that were purposely run over by cars, puppies who were chained and abandoned without food or water, Pit Bulls whose ears were cut off with a pair of scissors. Undeniably, there are fates worse than death. Abuse may not be the norm, but sadly, it isn’t rare — the pervasiveness of cruelty astounds me. No question, it’s more merciful to euthanize an animal than to sentence him to a life of abject suffering. A fate worse than death? Hard to conclude without specific circumstances or knowing the animal. In my own neighborhood, I see this all the time — dogs who spend all day alone in the backyard. Maybe some animals are ok with such an existence. Others, I’m quite sure, are not. It’s the are-nots I worry about. Critics of the No Kill movement claim too much emphasis is placed on adoption: Get the animal out of the shelter and into a home to make room for the next stray, feral, or owner surrender. They say the quality of the home is sacrificed, often to the detriment of the animal, in order to move inventory. I say: a fair criticism. There is no standardized method for evaluating a potential adopter, no reliable way to predict where on the spectrum that potential home will fall. Each time an animal is adopted from my shelter, we silently hope he’s ending up in one of the great, or even one of the good, homes. A home where mental and physical stimulation, companionship, affection, and medical care is amply provided. We hope that only a few animals end up in adequate homes — where luxuries like companionship and stimulation are a little less frequent — and those who do land there are equipped to deal with it. And we hope that no animal ends up in a poor or inadequate home. But the fact is, there are plenty of these. In many cases, it’s not intentional cruelty on the part of the owner. Perhaps they’re just busier than they thought they’d be. Or maybe they weren’t told that living in the yard, segregated from the family, is especially lonely for social animals like dogs. Or could be they just don’t want to think that a pet needs more than ten minutes of attention a day to be healthy and happy. So what do you when a dog has already spent weeks or months in a crowded shelter? Do you send him to the inadequate home? What about taking it a step further: Do you remove an animal from such a home only to euthanize him? It’s impossible to make these decisions or even evaluate specific cases without anthropomorphizing. The fact is, I’ll never know what it’s like to be a dog. How can I make a compassionate decision about whether I would want such a life, viewing it through my own human sense of perception? And my answer — what sort of life would be acceptable to me as a dog — might not match yours. Here’s what I know. Shelter adoption screening shouldn’t be so tough that it scares away potentially great guardians. Nor should it be so lax that no precautions are taken to ensure an animal is going to a decent, appropriate home. But to leave this issue for shelters alone to handle is the wrong tack. As a nation, we need to redefine what it means to responsibly “own” an animal. We’re horrified to hear of parents who neglect their child or fail to provide love and security. Likewise should we react to dog owners who keep their canine family member isolated, chained, or otherwise deprived. Whims are for acquiring potted palms, not puppies. Promising your child a Cocker Spaniel after renting Lady and the Tramp should be no more legal than bringing home a Swiss adolescent after watching Heidi. No, raising a child is not equivalent to raising a dog. Humans are complicated; canines, less so. Their minimal requirements for health and happiness are easier to meet. But animals do experience loneliness, boredom, fear, and stress in a similar manner to people. Animals suffer tremendously. And for this reason alone we must tolerate nothing less than engaged, responsible owners. So the solution is not merely more adopters — it’s more responsible adopters. (And fewer animals.) But here’s the good news. It’s a lot easier to regulate animal havin’ than it is child havin’. We can, from an ethical standpoint, decide not only how many but which dogs and cats should go on to procreate. And we can do so responsibly, humanely, and economically. Read previous installment: Shelters could be doing (a lot) more. Read next installment: There are no “responsible” breeders.